The Grateful Dead first entertained the idea of going to Europe as early as 1967, and actually had a tour penciled in for the spring of 1968; in fact they even talked about coming home the long way, playing Australia and Japan, too. However, when work on completing Anthem of the Sun dragged on that winter, the tour was scrapped. There were two one-shots in Europe a little later: in May 1970 a generous promoter brought the group over to the oddly named Hollywood Festival in Newcastle-Under-Lyme, England, where the Dead shared the bill with Traffic, Free, Mungo Jerry and Jose Feliciano, playing before 40,000 people on a stage that was framed by a huge inflatable phallus on one side and giant pink breasts on the other; very strange. And in June 1971, after a festival they were supposed to be a part of near Paris was rained out, the Dead played a couple of sets for a handful of townspeople from Auvers-sur-Oise (where Van Gogh is buried) on the grounds of the Chateau d'Herouville, a supposedly haunted mansion that doubled as a recording studio and party hangout for Europe's rock royalty all through the '70s. But the timing couldn't have been better when the Dead finally did make it to Europe for a tour in the spring of 1972. They were riding high on the success of Workingman's Dead, American Beauty and the live "Skull and Roses" albums. Garcia had just released his eponymous solo debut, and most of the band had pitched in to record Bob Weir's excellent Ace LP, released that spring. The Dead had turned a new corner with the addition of pianist Keith Godchaux in the fall of '71. With his deft rhythmic touch, strong instinct for imaginative coloration and uncanny ability to slide seamlessly into every genre the band tackled, Keith added power, dimension and flexibility to the group's sound - there are many Deadheads who consider the spring of '72 through the "retirement" shows in the fall of '74 to be the Dead's creative apex. The '72 Europe campaign also marked the band's first extended outing with new backup singer Donna Godchaux; another fundamental change in the band's sound. Europe would be Pigpen's final tour, and though he was thin and weak from the liver disease that would take him from us a year later, his spirit was still strong. He never lost that mischievous twinkle in his eye and he gave his all, night after night, leading the band through show-stoppers such as "Good Lovin'," "Turn On Your Lovelight" and that blast of locomotive chaos known as "Caution," as well as newer tunes like "Mr. Charlie," "Chinatown Shuffle" and the potent, gospel-flavored "The Stranger." All of those are represented here, and Pigpen can also be heard laying down sweet, soulful organ on many songs; his smooth B-3 fills meshed beautifully with Keith's more percussion attack. What are we to infer from the fact that the Dead's 1972 European invasion force left America on April Fool's Day and arrived in London on Easter Sunday? Appropriate for Holy Jesters, perhaps. Everyone had five days before the first concert to deal with jet lag and adjust to the famously inclement weather; still, nearly everyone picked up sniffles and hacking coughs. That wasn't enough to keep anybody down, though. In loose groups of twos, threes and fours they hit the sights, from Westminster Abbey and the Tower of London to Stonehenge and Solisbury Hill out in the verdant English countryside. Every night, without fail, there was some sort of party to go to - it's no surprise that the Dead' arrival had been hotly anticipated by the leading lights of London's freak community, who were eager to rub shoulders with the already legendary Californians. And England was definitely special to the Dead, too; an undeniable part of their musical and cultural roots. The first two shows of the tour were at the Wembley Empire Pool, a cavernous structure that had been built to host swimming events for the British Empire Games, held in London in 1934. By the '70s the pool had long since been covered over and the place was mostly used for concerts, boxing and equestrian events. Bob Weir recalled that when the band arrived for the equipment load-in the first day, the arena was freezing inside and the acoustics were abysmal. But as the Dead crew meticulously set up the band's gorgeous matching tie-dye amplifiers and the P.A., some giant heaters were suddenly fired up and a mass of jellyfish-like parachutes descended part-way from the ceiling to kill much of the annoying echo. Both nights at Empire Pool, the Dead played to almost full houses - about 9,000 people - ninety-five percent of whom had never seen them perform. The shows made lifelong fans out of many of them, and even the notoriously mean-spirited British music press raved about the Dead. One fan recalled getting on the London Underground after the second show and joining everyone in the train car in a spontaneous, spirited sing-along of "Casey Jones." From London, the Dead made their way up to Newcastle, near the rugged coast of the North Sea. They played a single night at the 1,500-seat City Hall, a lovely theater that since the late '20s had hosted countless classical music concerts, as well as rock shows by everyone from The Beatles and Stones to local heroes The Animals. Weir complained that the show drew "the coldest, stiffest audience I've ever played for," but that didn't prevent the band from turning in a good show. From there, it was off to the Continent by ferry through dark, roiling, heaving seas, and two months of high times and wonderful shows in Denmark, Germany, France, Holland and Luxembourg - this is the oft-told saga of the Bozo and Bolo buses, the rise of Hypnocracy and other adventures that have become an indelible part of Grateful Dead lore. Somewhere in the middle of all that madness, though, the Dead returned to England for an appearance at the Bickershaw Festival, a sort of micro-Woodstock held in a desolate area near the Lancashire town of Wigan, outside of Manchester. The show fell on drummer Bill Kreutzmann's 26th birthday, and it also marked a reunion of the Dead and the New Riders of the Purple Sage, who had been gigging around Europe independently. Typical of the festivals in that era, Bickershaw was fabulously eclectic, with acts including The Kinks, Dr. John, the Incredible String Band, Country Joe McDonald and Captain Beefheart, among others. True to the Woodstock model, it rained day and night for nearly the entire festival - tarps and tents were no match for the deluge that turned the entire site into a murky swamp. New Riders guitarist David Nelson remembers playing during "a squall," but miraculously, by the time the Dead hit the stage early Sunday evening, the dark skies parted in the west and streaks of golden light dappled the clouds. The security personnel had long since abandoned the gates and a stream of locals, including miners and their families, wandered the festival grounds, gazing at the mud-caked hippies and trying to fathom this bizarre American music. Cartoons were projected onto screens on either side of the stage as the Dead played, and during one jam fireworks lit up the sky. As the Dead ended their performance that night, a message in lights flashed above the stage: "YOU'LL NEVER BE STRAIGHT AGAIN!" The Dead closed their Europe tour in London the last week of May with four concerts at the cozy, venerable Lyceum Theatre. Built in 1909 as a legitimate theater, it had been transformed into a ballroom - the downstairs had been gutted, but it still had plush seats in the balcony and the side boxes. The New Riders were on the bill for these shows, and folks from the two groups' respective labels used the occasion to shower the crowd with little promotional items bearing the logos of each band. Though the Dead were a little frayed around the edges from two months of traveling and partying and playing gigs, they still managed to pull it all together and deliver a series of solid and at times spectacular shows. These four discs collect some of the strongest performances from the Dead's shows in England in 1972; together they form the most comprehensive document of the Europe tour yet. Listening to this I'm struck again by the staggering range of the material: the bright bounce of then-new songs like "Ramble On Rose," "Greatest Story Ever Told" and "Mexicali Blues"; the overpowering force of the jams in "Dark Star," "The Other One" and "Caution"; the joyous, rocking glory of "Sugar Magnolia" and "Not Fade Away"; the exquisite passion of "Wharf Rat," "Black Peter" and "Comes A Time." This truly is the Dead at their best, a long way from home, but takin' it to the world. Blair Jackson is author of "Garcia: An American Life" and former publisher of The Golden Road. Thanks to John Edwards, Nick Molland and the gang at Eurotraders. 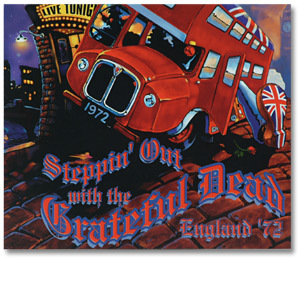 Steppin' Out with the Grateful Dead was released in 2002. It is a compilation of seven shows from England during April '72 during the Europe '72 Tour. This album is one of four which have come from this incredible tour with the others being; Europe '72, Hundred Year Hall, and Rockin' the Rhein.